Here is the classic James Tone Stack as used, for example, in the 120-watt Orange Graphic. To keep the mathematics from becoming overwhelming, we'll make a few assumptions. First, we'll assume that the driving circuit has an output impedance of zero. For a low-impedance driver like a cathode follower, this is a highly-accurate assumption. 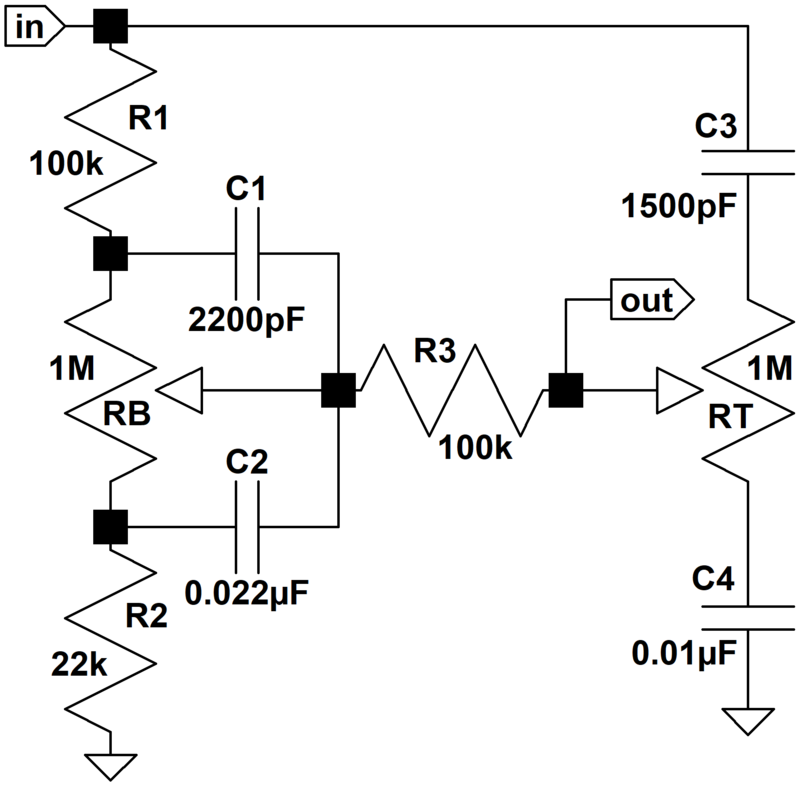 A typical 12AX7 voltage amplifier, however, has an output impedance of almost 40kΩ, which reduces the accuracy of our formulas. 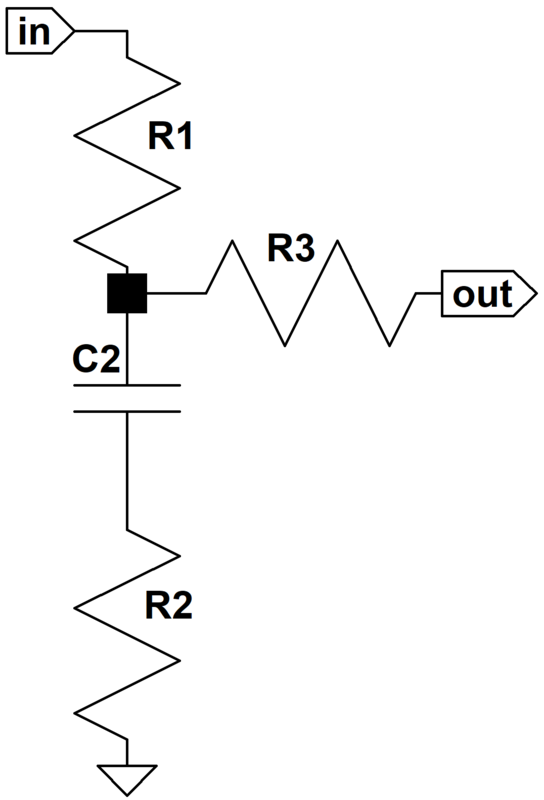 Second, we'll assume tone control resistances are infinite, because typical 1MΩ controls have much greater resistance than the other impedances in the circuit. Finally, we'll assume that the tone stack output drives an infinite input impedance. Typically the input impedance to the next stage is at least 1MΩ. These assumptions make it easier to design the James tone stack and calculate the required parts values. Once the circuit is finalized we can test the results under real circuit conditions. Let's begin by setting the bass and treble controls at maximum. This shorts C1 and connects R3 to C3. 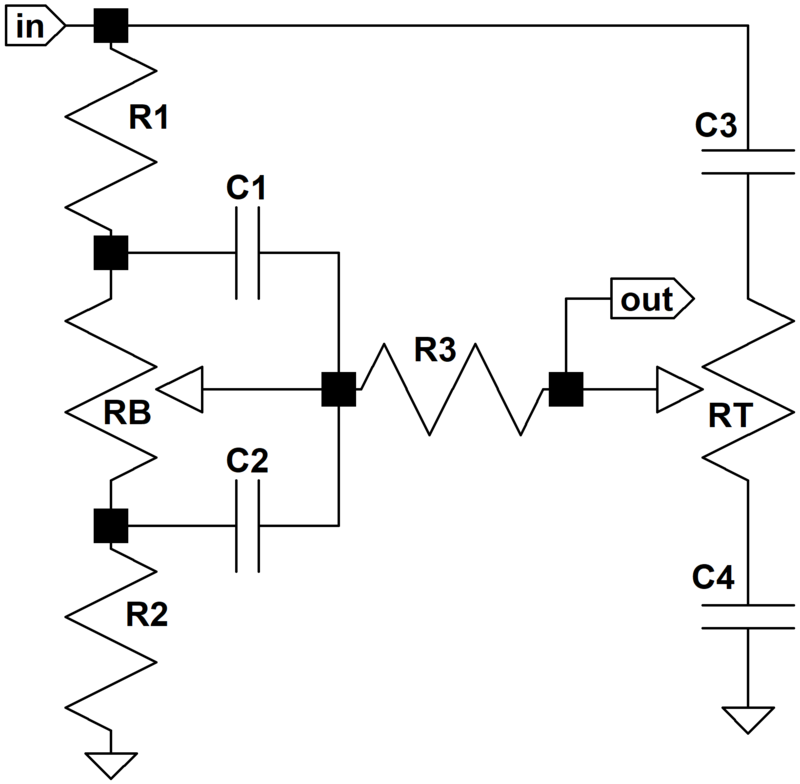 Because we're assuming the control potentiometers have much larger values than the fixed resistors, their resistances are effectively disconnected from the circuit. C3 is smaller than C2 and dominates performance only at treble frequencies. At bass and midrange frequencies we'll assume it is an open circuit. This approximation will prove very helpful in understanding circuit performance. In the spirit of divide-and-conquer, we'll look only at the low frequencies first. Let's say all this once more and then introduce some hard numbers to make it even more clear. We have the bass control set to maximum, so we have no attenuation at very low frequencies. At the first transition frequency attenuation begins, ultimately decreasing at a rate of 20dB per decade until we reach the bass-midrange transition frequency where the gain levels off at a steady midrange attenuation value that lasts until we reach treble frequencies and C3 starts conducting significant current. Now for some hard numbers. which is 329Hz. At this point the gain is 3dB above its midrange value of -15dB. Now we are ready to draw the Bode magnitude plot for low and midrange frequencies with the bass control at maximum. For the pole we draw a horizontal line at 0dB until we reach the transition frequency of 59Hz. Then we draw a line sloping downward at the rate of 20dB per decade. For the zero we also draw a horizontal line at 0dB until we reach 329Hz, where we then draw a line sloping upward at 20dB per decade. The actual frequency response is very close to the sum of these two approximations. Here is the plot. The approximate pole response and the approximate zero response are the dotted and dashed lines, respectively. The actual response, which includes the 3dB differences at the transition points, is the solid curve. 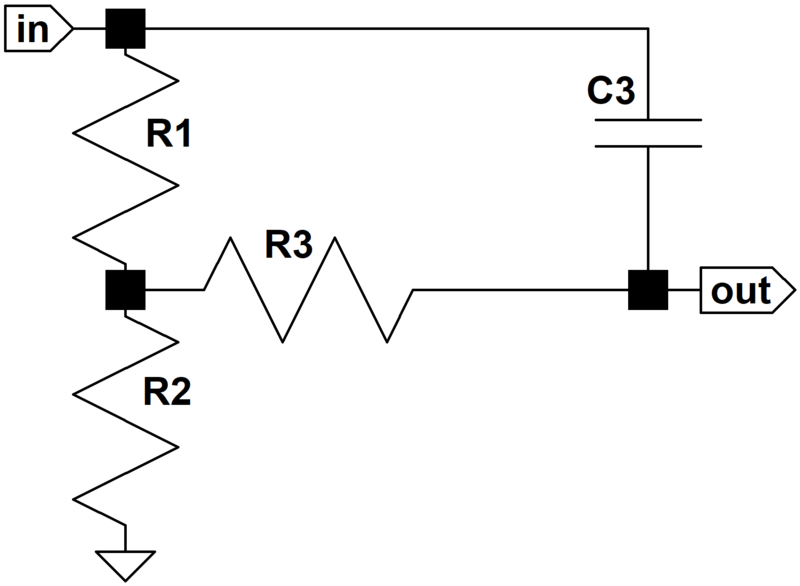 At high frequencies C2 acts as a short circuit and C3 comes into play. 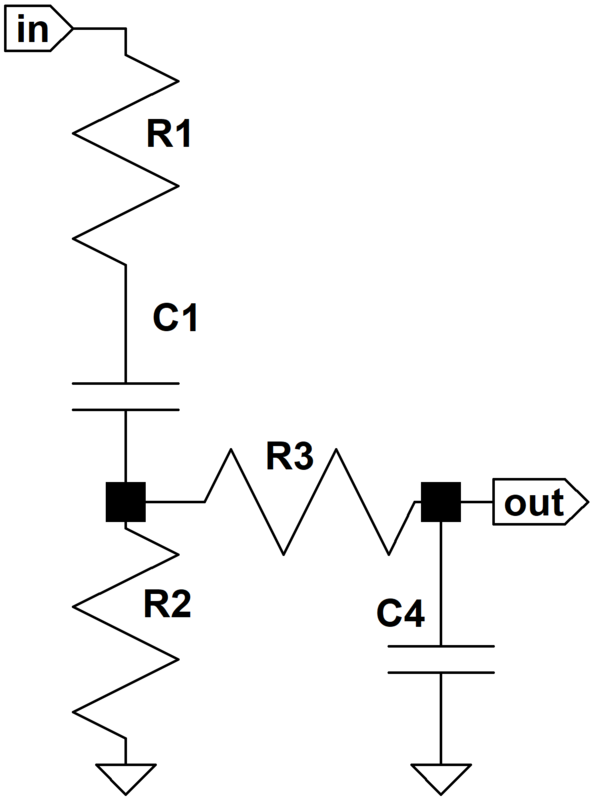 The capacitor is an open circuit at DC, there is no current through R3 and thus no voltage drop across it. Thus the output voltage is equal to the input voltage reduced in magnitude by the voltage divider formed by R1 and R2. This also makes sense, because at infinitely high frequencies the capacitor is a short circuit. The second represents the midrange-treble transition frequency and the first represents a transition to zero attenuation at high treble frequencies. 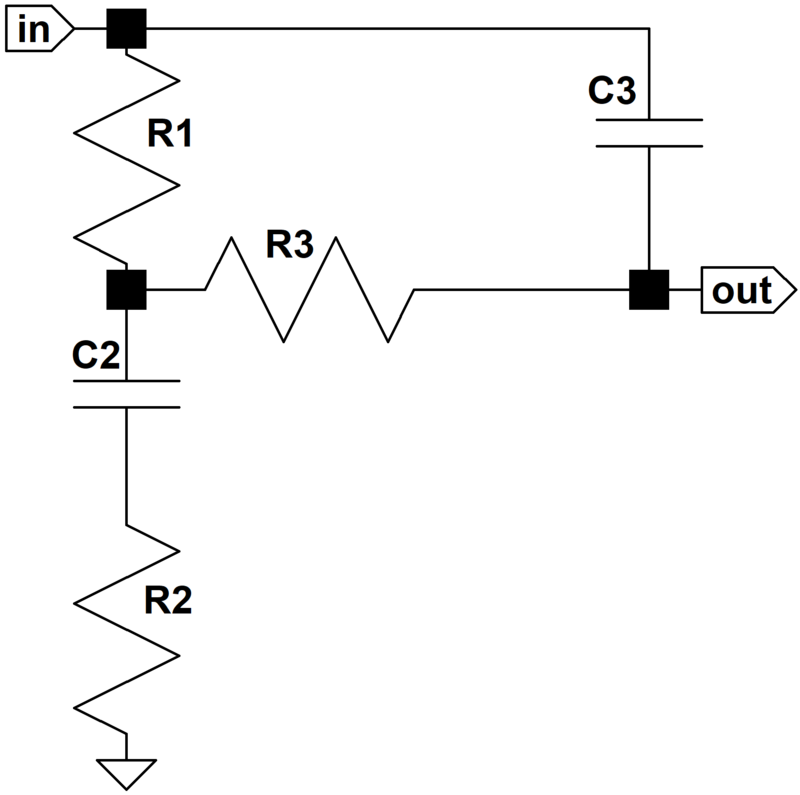 The gain thus begins at the midrange level created by the voltage divider formed by R1 and R2. It then breaks upward due to the zero at the midrange-treble transition frequency, ultimately rising at a maximum rate of 20dB per decade. Finally it breaks back to a flat response at the second transition frequency due to the pole. The Orange Graphic uses C3 = 1500pF, for which the transition frequencies are 162Hz and 900Hz. Here is the Bode magnitude plot. Here are the two Bode plots superimposed. The bass-to-midrange plot is only valid at low frequencies and the midrange-to-treble plot is only valid at high frequencies. The complete response is a gradual combining of the two plots. Our calculations assume an ideal source, an ideal load, and infinite-impedance tone controls. Here is the actual response using Electronics Workbench Multisim®. The plot assumes 1MΩ tone controls, a driving circuit output impedance of 49k (using the Orange Graphic's 220k plate load resistor), and a driven circuit input impedance of 1MΩ. (The horizontal axis is a log scale of frequency from 10Hz to 10kHz and the vertical scale is from -20dB to 0dB.) We see that the real world impedances of the driving and driven circuits cause additional attenuation, but otherwise there are no surprises. Maximum attenuation occurs right where we expect. At DC, where s = 0, and at infinitely high frequencies, where s approaches infinity, the equation shows that the response is zero, which makes sense when the controls are at minimum because at DC the capacitor C1 is an open circuit and at the extremes of treble capacitor C4 is a short circuit. but at the first transition frequency a pole kicks in and the gain starts leveling out. At the second transition frequency the other pole causes the gain to drop 3dB. Thereafter gain decreases further at the rate of 20dB per decade. (The vertical scale is -50dB to 0dB.) Here we see that under real circuit conditions the attenuation is less dramatic and shifted downward in frequency. The James Tone Stack: Creating Your Own Design.